How can I create the worksheet to allow these cells to be amended when the whole sheet is protected? Now you know to use. Check out my convenient one-page guides. At this point, what you will do to get everything in your hands? Worksheet protection is particularly frustrating because you have to apply it one sheet at a time. I can't take credit for the code as I merely found it in a moment of need and I can not find where the site is anymore. Many times the only reason for protection a sheet is to prevent the user from making inadvertent changes. After following all above steps carefully, you can use new Excel sheet without any restriction.
. To do the same, follow the steps mentioned below: 1. Click on Insert, select Module. How to unlock Excel Spreadsheet for editing when forgot password Lock the cells on your Excel spreadsheet and protect them with password can helps to prevent other users from accidentally and deliberately changing, moving or deleting the data on your Excel worksheet. 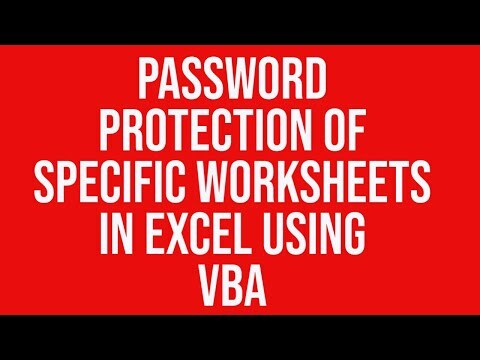 You can use this Worksheet Protection password, only to prevent accidental updates happening to an Excel Workbook. Is there a vba code to unprotect and the protect the cells back once the vba code is ran? Keep looking this space for a detailed article on the same. ProtectContents Then For Each PasswordSize In Array 5, 4, 6, 7, 8, 3, 2, 1 If TrySheetPasswordSize PasswordSize, PasswordsTried, Password Then Exit For Next PasswordSize End If If Not ActiveSheet. Hi, I have a code like below, but when I used the protected and shared workbook, it doesn't work. But if you have 15 sheets to protect with a password, it is going to take a while. What could go wrong with using Index? Now if you want to write something in the sheet then you will get a message that the sheet is protected…. The code I used was. True allows to protect all shapes in the Sheet. After this, it becomes easy for you to modify the document without type of restriction. To do the same, hit Ctrl + N key and new blank sheet will open 5. Names stay the same, index changes. First of all, open your Excel file and got to the sheet, which is password protected 2. So that user can have the option to enter required password. 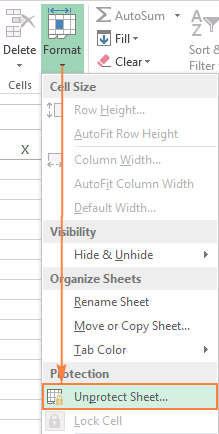 By default Excel assigns standard code names Sheet1, Sheet2, Sheet3 etc. If your Sheet is not protected by any password then this parameter can be omitted. Select all the data on the sheet that needs to be unlocked. However, make sure that you make a note of the password and do not lose it. This method explained here is to educate that there is an easy way to unprotect locked Excel sheet just with few lines of Excel Macro coding. All contents © 1998 - 2019 MrExcel Publishing All rights reserved. Double-click on the worksheet tab and enter a new name, or right-click on an existing worksheet name, then choose Rename from the context menu. You can only use Code Names for worksheets in the same workbook as your code. When developing that spreadsheet it can become very tedious to enable and disable Worksheet Protection or any other form of Excel protection. The two topics are closely related, so if this post does not provide the information you need, then. If you want to delete the restrictions of all worksheets, we can unprotect all worksheets at a time. What I would like to do though via a personal macro is remove the protection and therefore make it an unprotected worksheet. Also I have made a macro create password based on certain user inputs, but need to use that password to protect the sheet which can be passed as a parameter. Sub UnlockWorksheets 'This routine will go through and Unprotect all the worksheets for the workbook Dim wsWorksheet As Worksheet For Each wsWorksheet In ActiveWorkbook. Now, to copy the selected content, hit Ctrl + C key or you can right-click on the cell and choose Copy option 4. Hence, there can be situations that passwords are lost or forgotten by any means. It will generate a usable code that will unlock your protected sheet. The warning message will not occur now. However, if unfortunately , you won't be able to edit the protection part of worksheet too. 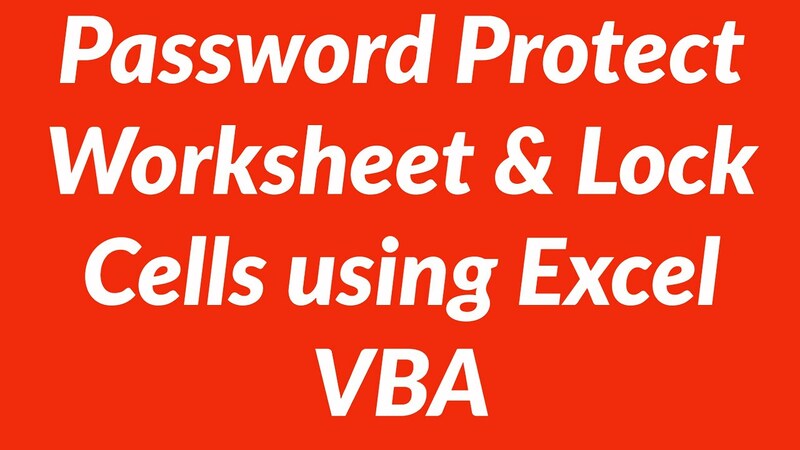 Here are the steps to remove the password from a protected excel workbook. Any Trustworthy Method to Crack Password Protected Excel 2016, 2013, 2010, 2007 or 2003 File? The code below will catch the error and provide a custom message. But there are lots of ways to reference sheets for protecting or unprotecting. In the Review menu tab click Unprotect sheet. Using this method you will be able to protect your WorkSheet. Step 4: Re-Enter the same password This popup will appear only if you have passed a password in the previous step Now you are done with Protecting your Worksheet. Thousands of people have learned new skills and increased their effectiveness at work with our help. The execute this code as explained below. 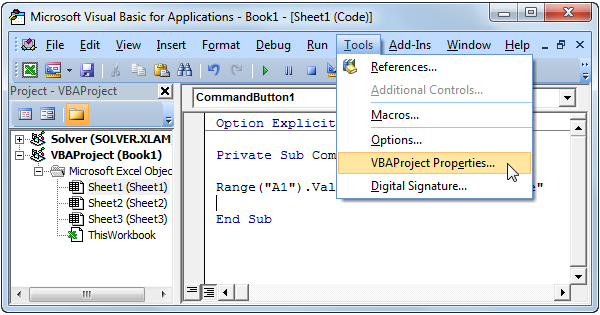 It is executed in visual basic source code and this file is used to add functionality to the various Office applications. Note: This code is provided so that it help if you lost a password for your protected Excel sheet. After that, choose the cell A1 and hold Shift + Ctrl + End key to choose all cells containing content in the worksheet 3.